Tigger has always been a fan of toys that he can build with, especially if it incorporates some sort of track system. BRIO wooden toy sets have been delighting children for many years and it was when Tigger was at preschool that he was introduced to the BRIO range. The wooden sets are so hard wearing that they are ideal for use in the home, grandparents or nursery/school environment. We were lucky enough to review the BRIO Firefighter Set earlier this year and Tigger still enjoys setting up the tracks and dashing around the track to fight the fires. This Christmas if you are looking for a toy that will last throughout the years and something that can ben added to as desired, then I suggest you take a look at the range of BRIO starter sets. Wow! So much fun at the same time for the youngest train drivers. Start by building a track layout with the mountain blocks and the tunnel, and let your train go up and down and through the tunnel. Press the arrow button on top of the engine and the train starts to move by itself. The wagon with the spinning wheel makes it extra fun to watch the train passing by. There is a fire and they need your help! Drive immediately to the docking station and fill the fire train with water and gas. The firefighter goes along in his fire truck with sirens and light. Put down the fire with the fire hose on the wagon. 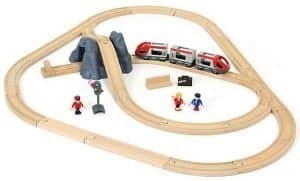 For more action, just add more BRIO wooden tracks. It’s time for some serious firefighting in the mountains. Open the garage door and drive to the scene of an accident – with sirens and lights on, of course. Your assistant firefighter follows in the rescue train. No time to wait – toot-toot! Everything you need to build and play with your first BRIO railway in an ultimate way. Use the stop and go signal to stop the train and let passengers board the train. 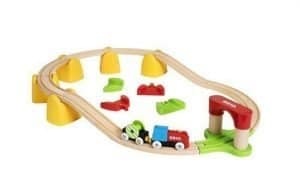 If you want to extend your track layout get some extra tracks with the Starter Track Pack. And have more fun. To help your little one discover the world of BRIO, we have been given a BRIO 33815 Firefighter Set to giveaway to one lucky reader.